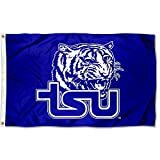 NASHVILLE – Tennessee State jumped out to a 14-7 first quarter lead, but was not able to keep the pace as they dropped a 35-17 contest to Vanderbilt on Saturday evening. The two teams, playing for just the second time and the first time since 2006, played in front of 31,084 at Vanderbilt Stadium, as well as in front of a nationally televised audience on ESPNU. Ronald Butler totaled 325 yards as he rushed for 40 yards, while throwing for 285 yards and two touchdowns as the Tigers fell to 5-2 on the season. Khari Blasingame ran for 100 yards and scored three touchdowns for Vanderbilt, as they improved to 4-4. Blasingame was one of two Commodores who went over 100 yards on the ground. As a team, Vandy rushed for 385 yards, which helped the SEC opponent outgain the Tigers 501-410. Patrick Smith was on the other end of both of Butler’s scoring passes. The first came on the second play of the game as Smith caught the Butler pass in stride at his own 38 yard line and out ran the Vandy defense to the end zone. The scoring play tied for the second longest in the FCS this season and the longest in the Ohio Valley Conference. The play also tied for the second longest in school history, matching a Joe Gilliam, Jr. to Joe Sweet connection which was set Nov. 22, 1969. After Vanderbilt evened the score at 7-7, The Memphis, Tenn., native hauled in his second touchdown of the game on a two-yard reception to put the Tigers on top, 14-7. Smith now has eight touchdowns on the season and 18 in 17-games over two years. Smith finished with seven receptions for 170 yards, averaging 24.3 yards per catch. Vanderbilt answered midway through the second quarter making the score 14-14. The Tigers came right back behind the running of running back Erick Evans. The redshirt junior busted through the Commodore defense for back-to-back runs of 23 and 21 yards, respectively. The second of the two carries moved the Tigers down to the Vanderbilt with six minutes to go in the half. The drive stalled, making the Tigers settle for a 37 yard field goal, which put the Big Blue back on top, 17-14. The lead was the last for TSU as Vanderbilt needed less than three minutes to move 78 yards in five plays to enter the end zone for a 21-17 advantage with 1:46 remaining in the half. The Tigers tried to respond after receiving the ball at their own 35 after the Commodores kicked the ball out of bounds. Butler opened the drive with a 17 yard pass to Steven Newbold crossing into Vandy territory. TSU continued the attack as Evans ran for three yards and caught a ball out of the backfield for another 17, moving down to the 28. Two plays later, the Tigers last minute push ended as Butler was intercepted with 35 seconds remaining on the clock. The second half was controlled by the Vanderbilt running game as the scored on the opening drive of the fourth quarter extending the lead to 11 at 28-17. The Commodores added the insurance score midway through the fourth quarter to close out TSU. Evans finished the game with 98 all-purpose yards, earning 69 on the ground and 29 through the air. Newbold added to the Tigers pass attack with five catches for 62 yards. Defensively, Antonio Justice, Jr. tallied a team-high eight tackles, while fellow linebacker Chris Collins added seven solo tackles. David Kamara collected six tackles and earned a pair of pass breakups. In his first game back, after missing two due to injury, Ebenezer (Ebo) Ogundeko had two tackles, including a sack and a quarterback hurry. The sack gives the defensive end 5.5 sacks and 9.5 tackles for loss in five games played this season. The Tigers will return to Ohio Valley Conference play with a road trip to face Murray State on Oct. 29.